Given a database of edges and nodes representing an undirected graph, e.g. write the following prolog predicates. 1. connect(+X,+L). Define the predicate connect/2 which tells you if the node X is directly connected to every node in the list L.
2. simple_path(+X,+Y,-P). Define the predicate simple_path/3. Given two nodes X and Y, P should contain a path between X and Y in the graph which does not revisit any node. Upon asking the prolog engine for more results, every such path should be produced. 3. hamiltonian_path(-P). Define the predicate hamiltonian_path/1. P should contain a path between any two nodes in the graph which visits every node exactly once. Upon asking the prolog engine for more results, every such path should be produced. 4. hamiltonian_cycle(-C). Define the predicate hamiltonian_cycle/1. C should contain a path between any two nodes in the graph which visits every node exactly once and where the first node in the path is connected to the final node in the path. Upon asking the prolog engine for more results, every such path should be produced. 5. This question uses the sicstus finite domain constraint problem solver. This will be discussed in class. Notes on its use can be found at http://www.cs.ualberta.ca/~you/courses/325/Mynotes/Log/clp-intro.html. Only one meal of each theme may be offered in any night. Also, obviously, each of the two (or three) meals offered in a night must be distinct. Define the predicate menu/5, which takes parameters of the form menu(-X, +D, +V, +M, +F). D contains a flat list of the themes of the various meals offered. V, M, and F are a count of the number of vegetable-, meat- and fish-themed meals in the list D. D will be ordered such that all vegetable-themed meals come first, followed by meat-themed meals and fish-themed meals. falafel is guaranteed to be the first vegetable-themed meal and sushi is guaranteed to be the first fish-themed meal. menu should bind X to a list of the form X = [[M1,M2],[T1,T2],[W1,W2],[R1,R2],[F1,F2],[S1,S2,S3],[X1,X2,X3]], where M1 contains the first of two meals offered on Monday, and M2 the second of the two meals offered on Monday, and so on. Each entry in X will be the index of the meal in the list D (with 1 being falafel). One further constraint is imposed here, in order to reduce the number of possible results. The order of the meals presented for each evening should be the same as in the list D.
Meaning that Monday is serving falafel and f2 (sounds tasty), Tuesday is serving v2 and m1, and so on. Due to the large spaces being searched, it may take a while to find all possible menus. Your code should enumerate all possibilities and fail (print no) when no more can be found. The notation + in the specs above means that the variable will always be instantiated when the predicate is called. The -, on the other hand, means that the variable will always be uninstantiated. Ensure that you remove or comment out all definitions of nodes and edges from your submitted file. You may find it useful for part 1 and beyond to define a rule joined(A,B) which is true if either edge(A,B) or edge(B,A) is in the database. Do not use the disjunction operator (;) for questions 1 through 4. You may use it for question 5. Do not use the cut (!) or the not (\+). Do not use the if-then-else predicate (-> ;). You will definitely find the built-in predicate findall/3 helpful. findall finds all data that matches a certain goal. For example, the goal findall(A,node(A),Nodes) determines all possible A for which the goal node(A) is true. It then places them in the list Nodes. 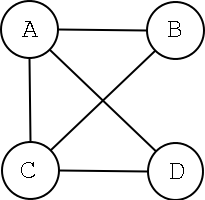 So findall(A,node(A),Nodes) for the graph above would bind Nodes to the list [a,b,c,d]. Try your code with graphs other than the simple graph given above. Block comments in Prolog code are delimited with /* and */, end of line comments start with the character %. You must use the finite domain constraint solver for question 5.